> The Whitman-Hanson varsity baseball team won its sixth game in a row against no defeats. Holding Hanover to 2 runs, the Panthers scored 1 run in the top of the first, 3 in the fifth, and added 3 more in the seventh. > The big hitter for the W-H was Mike Cook, who broke open a 1-0 game in the top of the fourth with a bases-loaded double to make the score 4-0. In the seventh Rian Schwede led off with a double of his own and catcher Derek Frank walked before Cook roped his second double of the day to knock in to more W-H runs. Chris Zalewski knocked in Cook to close out the Panther scoring. > Ethan Phelps pitched 6+ strong innings for W-H before giving way to Tommy Marshall. Marshall closed the game out with 2 Ks before Derek Frank threw out another runner to end the game , this one trying to steal third. > W-H is now 6-0 overall and 4-0 in Patriot League play. The lady panthers girls tennis team defeated Hanover today 5-0. At 1rst singles Lexi Connolly didn't drop a game and won 6-0,6-0, at 2nd singles Abby Pulling won 6-1,6-3 and at 3rd singles sophomore Julia Benvie won 6-4,6-2. The first doubles team of Chloe Wilson and Divya Kumar won 6-1,6-1 and at 2nd doubles Nandita Kumar and Kyla Faghan won 6-3,7-6(7-5). The lady panthers are 4-3. 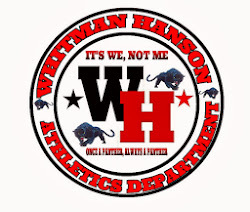 > Whitman Hanson Boys Track and Field team won its second meet today 75 to 61 over Duxbury HS. Boys won both relays 4 x 100 and 4 x 400. Shane Schraut won the 400 low hurdles and Dan Kline won the 110 High Hurdles. Billy Martell won 100M Nic Fernandes won the 200, Dyllan Burns won the 400, Brandon Hager won the Mile and Theo Kamperides won the 2 mile. Cullen Poth won the Shot Put. North Quincy – The Panthers traveled to Creedon Field at North Quincy High School yesterday for a 13-2 Patriot League win on the road. The Mario Troiani made 11 saves between the pipes as the Panther defense held Q/NQ to just 2 goals. Adam Solari collected 6 ground balls as the long stick middie while Will Polito was over 50% on face-offs collecting 5 ground balls and an assist for the day. Top Scorers were Ryan Downing (3g, 1a) and Sean Joanis (3g, 3a) who had a hat trick a piece. Mason Gorman (2g, 4a) was all over the field compiling 2 goals and 4 assists while also playing an instrumental role for the defense as well. Riley White (2g, 2a) Chipped in with a couple goals and 2 helpers at the attack while Shane Ross (1g, 1a), Kyle Hamilton (1g, 1a), and Griffin Nickerson (1g) all chimed in with a goal apiece. The Panthers host the Hull Pirates today for a rematch from a week ago. Despite it being a non-league game, it should be a play-off atmosphere today at O'Brien Field. Opening face-off today is at 4:00 PM. N. Quincy scored first and then WH went on 9 goal run. At half time it was 10-4. In the second half the Panter's only let in one goal and kept scoring. The defense held strong stopping some strong drives toward goal - anchored by Gabrielle Trongone, Chloe O'Neil, Marissa Connell and Joli Flamos. Brooke Beauregard and Ava Barry played well splitting time in goal. 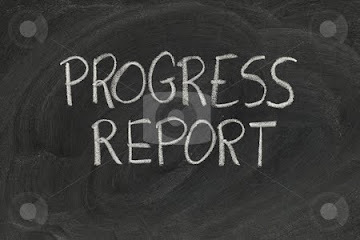 On the offense there was a strong showing with a record high 9 goal scorers - Zoe Lydon 3G 3A, Sami Whitman 4G 1A, Taylor Ross 3G, Brooke Connors 2G 1A, Riley Bina 1G 2A, Katie Mulligan 1G, Savannah Poirier 1G, Emily Berthiaume 1G, and Gabrielle Trongone 2A. WH is now 4 and 3 on the season and 2 and 3 in the Patriot League. The Whitman-Hanson baseball team won its fifth game in a row at Plymouth North 6-1. Rian Schwede won his third game on the mound as he gave up only one unearned run while going the distance. Ethan Phelps and Mike Cook led the Panther attack as they each had 2 hits . W-H struck for 2 runs in each of the first two innings and never looked back, adding 2 more in the top of the seventh. Second baseman Cook made an incredible diving play on the Plymouth North turf and recovered to throw out the runner and take away a sure hit. W-H is now 5-0 overall and 3-0 in Patriot League play. We are excited to be bringing a very special opportunity to the Whitman-Hanson community. WH Athletics has partnered with Independence Associates to bring the Rolling Celtics to our school on Friday May 3rd at 6:30pm. This organization plays wheelchair basketball and these athletes are very impressive. However, the real benefit of this program is to give our students an opportunity to gain a sense of empathy for those living with disabilities. Our students will be impressed with the courage and determination of these athletes. The program includes a demonstration of how wheelchair basketball is played and everyone in attendance will be offered the chance to participate. The coach of the team will teach our students and other adults how the game is played. Learn more about Independence Associates here. Bridgewater — the Panthers fell to Hull this morning 13-12 in the Bridgewater-Raynham Invitational consolation game. Mario Troiani made 13 saves on the day as the Panthers trailed the Pirates all game until they made a come back in the 4th quarter only to come up short by one goal. Will Polito (1g) was key in WH 4th qtr. comeback winning his last 3 face offs to give the Panthers a chance. Top scorers were Ryan Downing (3g,1a), Mason Gorman (3g, 1a), and Shane Ross (1g, 3a). Sean Joanis chipped in with 1 goal and 1 assist. Attackmen Riley White and Kyle Hamilton helped out the offense with 1 assist each. WH gets back to league play on Tuesday when they travel to North Quincy. Then the panthers will host Hull on Wednesday for a rematch. Whitman Hanson came out strong in the first half leading 5-1. WH was strong on ground balls which made a big difference in the game. WH continued their offensive attack leading 10-2 with 5:37remaining. The defense pulled together with great communication and Brooke Beauregard had a fantastic game in goal stopping multiple close range shots in the first half. On offense, there were 8 different scorers, the most in one game this season. Zoe Lydon lead the way with 2G 1A, followed by Brooke Connors 2G, Riley Bina 2G, Katie Mulligan 1G 1A, Emily Berthiaume 1G, Taylor Ross 1G, Sami Whitman 1G, and Emily Phelps 1G. This win moves WH to 3-3 for the season. Whitman-Hanson senior pitcher Rian Schwede won his second game on the mound in as many tries as he hurled a 1-hitter, and the Panthers beat Scituate on the road, 2-1. The only run Schwede gave up was unearned on a two-out double by Scituate's catcher Reidy. His hit knocked in the lead-off batter May, who had reached on an infield error. Schwede's fastball was alive all day as he retired the side in order in innings 1,2,5,6, and 7, and only faced 3 batters over the regulation 21. Schwede's pitching line ended with him going 7 full innings, giving up 1 unearned run, on 1 hit, 1 BB, and 5 Ks. Sophomore Tom Marshall was outstanding at third base all day and came up big at the plate. In the fourth inning he broke a 0-0 tie as he delivered a double that scored Schwede, who had walked and was sacrificed to second on a perfect bunt by junior Devin Coulstring. Danny Kent , who also played outstanding defensively, also walked in the fourth inning and scored on an error. After its second 2-1 win in a row, Whitman-Hanson is now 3-0 overall and 3-0 in the Patriot League. Whitman – The Panthers won a nail bitter 8-7 in OT this afternoon when they hosted Rockland at O'Brien Field. Mario Troani had 14 saves between the pipes and the WH defense played great all game. The Panthers tied the game 7-7 with less than a minute left in regulation to send the game into overtime. Sean Joanis ended the game 12 seconds into OT with a scrappy goal in front of the net after Will Polito won the face-off. Joanis had 2 goals. Shane Ross had 2 goals and Mason Gorman put up 2 goals as well. The Panthers are back at it next Tuesdaywhen they travel to Brockton to take on Cardinal Spellman at 11:00 AM. Scituate – The Panthers traveled to Scituate today and lost a close one to the Sailors 11-8. Mario Troani was stellar between the pipes logging 15 saves and the Panther defense was active and resilient all game long. Mason Gorman and Ryan Downing paced the offense. Gorman notched 3 goals and 2 assists while Downing had 3 goals and 1 assist. Sean Joanis had 1 goal and 1 assist. Sophomore Kyle Hamilton also had one goal and one assist. Panthers are back on the road at Pembroke on Thursday for another Patriot League battle. Whitman- Whitman-Hanson Regional High School is pleased to announce the appointment of Jordan McDermott as the new varsity softball coach. Coach McDermott spent the last 3 seasons as the head coach at Massasoit and led the Warriors to the Region 21 championship in 2018. Massasoit advanced to the NJCAA Division III District H tournament, falling to host Anne Arundel CC in Arnold, Maryland. Coach McDermott, who works as a para professional at Indian Head Elementary School in the Whitman-Hanson school district, was a three-year starter and All-MASCAC selection at Bridgewater State in both softball and soccer and served as a captain during her senior season in each sport. In softball she finished her three-year career with a .304 batting average and had 42 stolen bases in 52 attempts. A versatile player, McDermott saw time both in centerfield and at shortstop. Her senior year she hit a career best .331 along with swiping a team-best 17 steals, only being caught once, leading the Bears to a 29-13 record. Coach McDermott graduated from Bridgewater State University, earning a bachelor’s degree in physical education with a concentration in recreation. “I am excited to share my passion and love for the game with the students of Whitman-Hanson. I looked forward to getting to know the players and work with them to achieve their goals. We will create a positive environment focused on fundamentals, chemistry and fun,” McDermott said. Whitman-Hanson plays in the Keenan Division of the Patriot League and tryouts for the season begin on Monday March 18th. Note: Information for this press release was taken from the Massasoit and Bridgewater State websites. 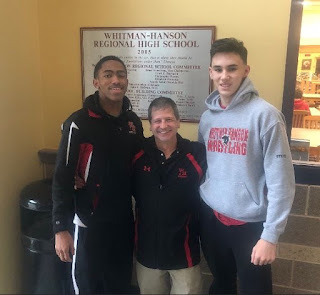 Whitman - Sophomore Cole Levangie (14 points) and Junior Ben Rice (13 points) led Whitman-Hanson to a 60-57 win over Dennis Yarmouth in the first round of the division 2 south tournament. Junior Max Borgen (9 points) was fouled with 4 seconds left while shooting a three pointer with the score tied and then hit all three shots for the win. DYs Logan Grosek was incredible scoring 26 points despite being double teamed all night. The Panthers advance to the quarterfinals to take on Randolph on Saturday. Today Junior Bethany Ralph wrestled in the First ever Massachusetts Girls State Championship and place 2nd in her weight class of 120 pounds. Bethany made it to the finals by beating her first opponent 9-2 and winning by a score of 4-0 in the semi-finals to advance into the finals. Bethany fell short of her goal losing her finals match but came away with a state runner-up. Congratulations Bethany for a great year and a second place State finish. Several Whitman-Hanson Wrestlers traveled to Beverly, MA for the Division 2 State Wrestling Tournament on Friday and Saturday. Sophomore Damari Goldsmith Greene wrestled well and finished in 7th place at 138 pounds. Damari finished at 3-2 for the tournament and one point away from qualifying for the ALL State tournament. Damari will attend as an alternate for his weight class. Damari finished the season at 29 wins and 17 losses. Junior Captain Steve Brooks also qualified for the State tournament at 152 pounds and wrestled very well for his first States. Steve finished the season at 18 wins and 12 losses while leading the team in pins with 16. The First ever Girls State Tournament will be held on Saturday February 23rd at Saint Johns Prep in Danvers, MA. Bethany Ralph will represent WH at 120 pounds. Bethany has been a 3 year starter for WH and I look forward to seeing her compete at this tournament.